If you’ve ever scalded the bottom of a pot of rice, wasting rice and creating messy cleanup for yourself, you know that the simple task of cooking rice (or cooking black rice) can sometimes be a real hassle. I cooked rice on the stovetop for more than 30 years before I got sick of inconsistent results and cleaning burnt-on remnants. I finally wised up and bought a rice cooker, and my life has been so much easier. Rice comes out perfect every time, and clean up is a breeze. Zojirushi is top on my list with this state-of-the-art rice cooker that makes multiple types of rice and porridge, has a setting to soak and steam rice, can toast rice with its “scorch” function, and uses induction heating for higher, more precise temperatures than conventional rice cookers. All of Zojirushi’s newest rice cookers use what they call “fuzzy technology”, meaning that the cookers monitor the contents of the cooking pot and makes adjustments based on the type of rice and the temperature. Ladies and the gentlemen, the future of rice cookers has arrived. The NP-NVC10 takes fuzzy technology to a whole other level; Artificial Intelligence-level. This cooker learns from your previous setting choices and tries to cook foods to your preferences. Basically, this rice cooker outsmarts humans (and conventional rice cookers) to make sure you get perfect food every time. 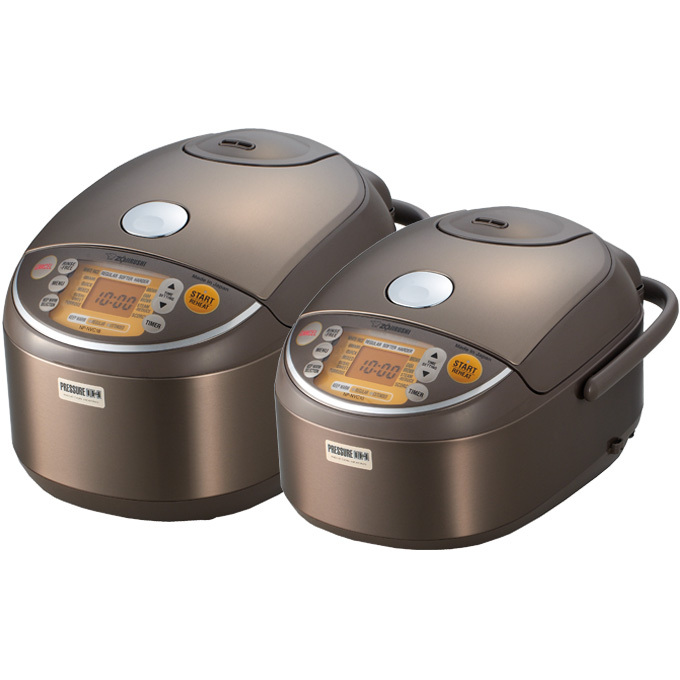 This rice cooker is made in Japan and comes in a metallic brown finish. The cooking pot has a non-stick coating, so clean up is easy. This Zojirushi model will make you wonder why all of your other small cooking appliances are so “basic”. And for around $$$ (on Amazon), it had better. Tiger Corporation is based in Japan, where it ranks as as a top-name in rice cookers (along with Zojirushi). Tiger’s new 10-cup Micom cooker is made in Japan and features a sleek stainless steel and black finish. This rice cooker has technology similar to the Zojirushi “fuzzy logic”, so it is constantly monitoring your food to make sure it is cooking it at the right temperature. It not only cooks your favorite types of rice, but it has a slow cooker function that allows you to cook soups and stews, porridge, and risottos. I get hungry just watching their video! 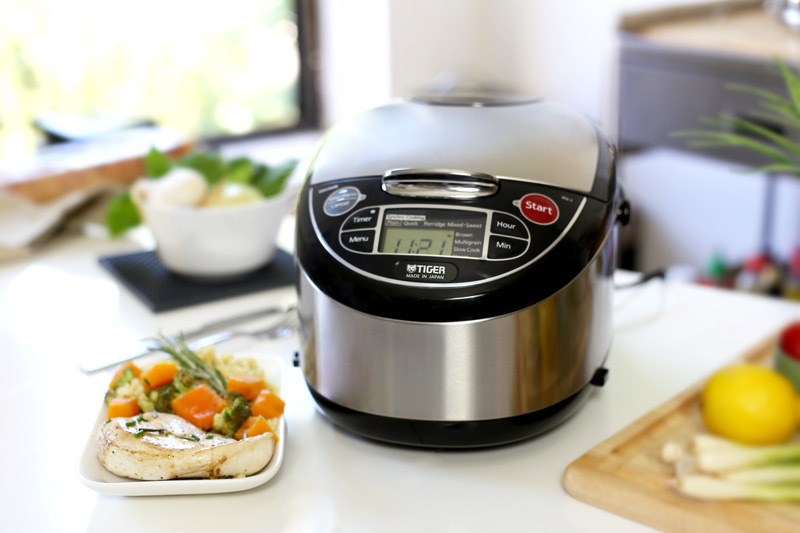 What really sets this rice cooker apart from others is that it has a synchronized cooking function (called “tacook”) that makes sure that all these features and functions work together to produce your complete meal at one time. If this doesn’t make your life easier, I don’t know what will! Tips: I usually use slow cooker to make hot dogs, you can test.​ I think it is awesome. The Tiger JAX-T18U-K sells for around $$ on Amazon. 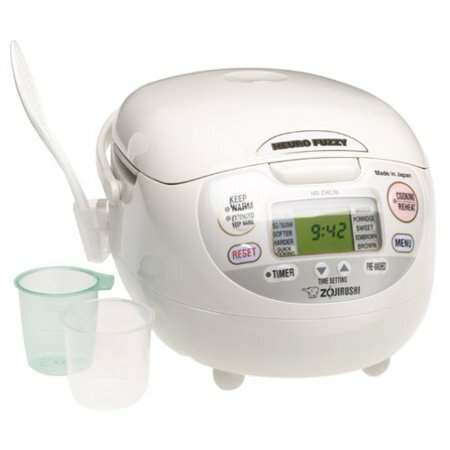 The folks over at TheSweethome.com did hours of research to find the best rice cooker, including talking to Asian experts in rice making. Their final recommendation was this Hamilton Beach 7-cup model (it holds up to 14 cups of cooked rice). This stainless steel unit looks more like a slow cooker than a rice cooker, but is said to make delicious Japanese rice that is comparable to models that are much more expensive. You can also make beans and pasta using its steam dish. 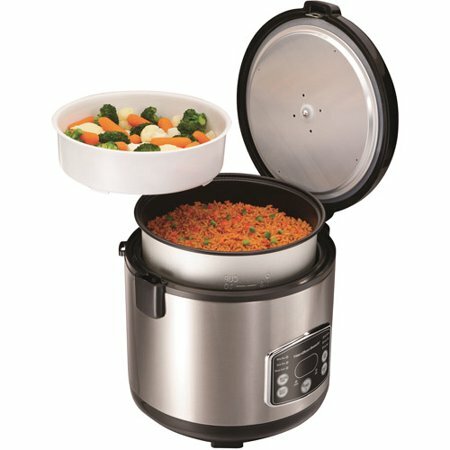 In terms of features and functions, the Hamilton Beach rice cooker, which is only $28.99 on Amazon, has a delay-start mode that goes up to 15 hours, warming function, a heat/simmer mode, and delivers a finished product faster than many of the more expensive cookers from Tiger and Zojirushi. This rice cooker makes clean up easy with its non-stick, dishwasher safe cooking pot and a removable lid liner. If you’re not looking for “futuristic technology” rice cookers, like the Zojirushi and Tiger at the top of this list, then this rice cooker is truly a great choice. It was the one chosen after hours of research, it simply makes great rice, and it does all of this at a bargain-level price. If it weren’t for those (admittedly very neat) “fuzzy logic” features, then this rice cooker would be at the top of the list. Zojirushi makes our list again with this cooker that is made in Japan and is just the right size for a couple or small family. 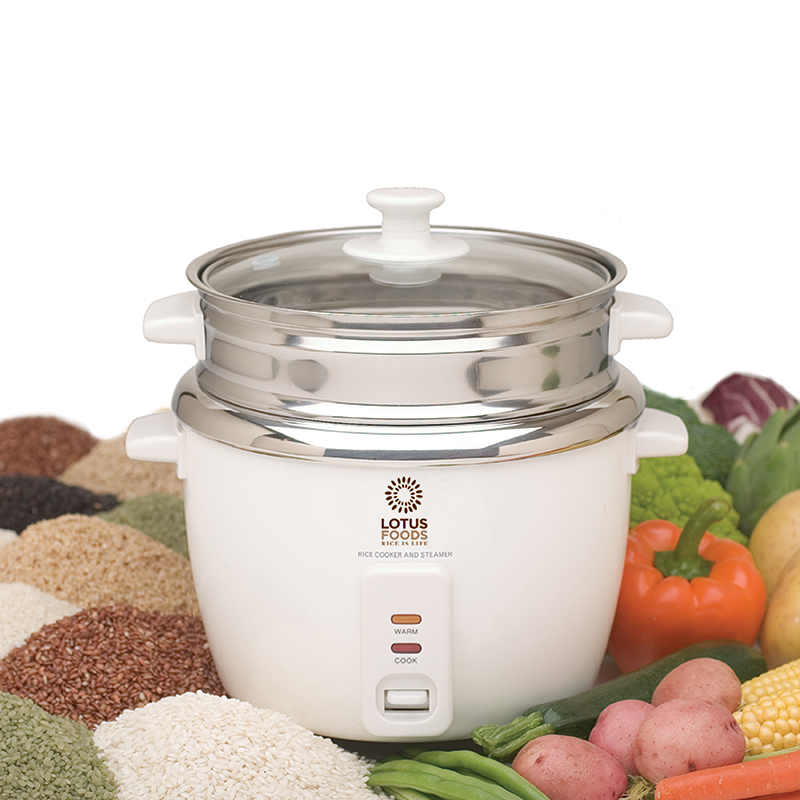 You can put 5 ½-cups of uncooked rice into this cooker, which will result in about 10 cups of cooked rice. This cooker makes the following types of rice: sushi, brown, mixed, and porridge. It also has a steam function, so you can steam foods like fish and vegetables while cooking your rice (or just on their own). Although there are a lot of buttons to play with on the front of this rice cooker, they lend themselves to the many features that I love, including: a delay timer (so your rice doesn’t start cooking too soon), a programmable beep to let you know when the rice is finished, and warming cycles that you can extend in case you’re not ready to eat yet. This rice cooker comes with everything you need to make great rice, including a spatula, spatula holder, and two measuring cups. It also has a retractable cord, so the entire unit can sit neatly on your countertop. This model sells for around $$ on Amazon. Here’s something you don’t see often: a rice company that makes and sells their own rice cooker! Lotus Foods’ 12-cup rice cooker got my attention over at Ezvid.com, where they ranked it the easiest rice cooker to clean, even though the inner pot is made from stainless steel and isn’t treated to be non-stick. The use of un-coated stainless steel makes this a standout cooker because the pot won’t rust or tarnish, and food odors won’t be absorbed and transferred to other dishes. At around $, you’re paying for a higher-quality cooking material, but you are getting a unit with fewer features and functions. There are plenty of rice cooker nay-sayers out there; people who think that rice cookers are a waste of money, and that cooking rice in a pot on the stovetop isn’t all that complicated. My experience is that I didn’t know what I was missing until I tried a rice cooker. If you’ve never cooked rice in an Asian rice cooker before, I really encourage you to give it a try. You may be pleasantly surprised to find out that there is a much easier way to prepare a household staple. 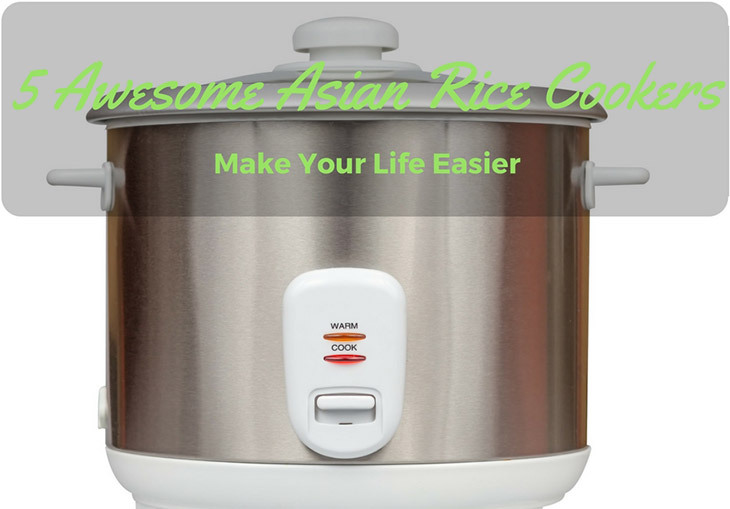 Do you use a rice cooker to save you time and hassle? Did your rice cooker make it onto this list? Leave me a comment and share your rice cooking experiences.